Steve Torrence drove to the pole in Top Fuel at Gateway on Friday. 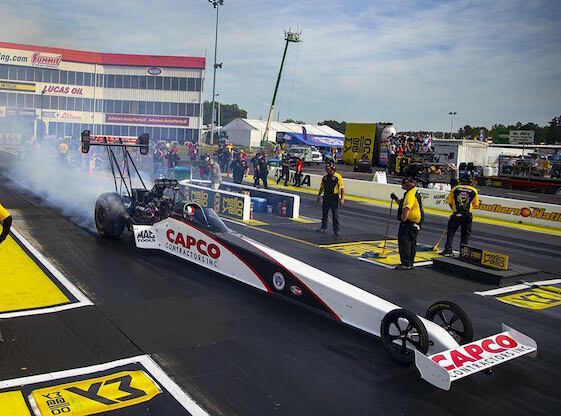 Point-leader Steve Torrence wheeled his Top Fuel dragster to pole position during Saturday evening’s final round of qualifying in front of a sold-out crowd at the seventh annual AAA Insurance NHRA Midwest Nationals at Gateway Motorsports Park. Robert Hight (Funny Car), Jeg Coughlin Jr. (Pro Stock) and Chip Ellis (Pro Stock Motorcycle) also emerged as No. 1 qualifiers in their respective categories at the second of six playoff events during the 2018 NHRA Mello Yello Drag Racing Series Countdown to the Championship. Torrence secured his third No. 1 qualifier of the 2018 season and 19th of his career after his final 1,000-foot run of 3.675-seconds at 327.19 mph in his Torrence Racing dragster. Seeking to notch back-to-back victories at the facility in Madison, Ill., near St. Louis, Torrence will race Bill Litton to open eliminations on Sunday. Provisional pole-winner Clay Millican finished second , courtesy of his 3.692-second pass at 329.83 mph run. Millican will meet Shawn Reed in the first round. Hight claimed his 60th career No. 1 qualifier and third of the 2018 season after his 1,000-foot run of 3.844-seconds at 326.16 mph from the last round of time trials. Hight, the two-time/reigning world champion from John Force Racing, will chase his second victory at Gateway Motorsports Park by racing Dale Creasy and his Dodge Stratus in the first round. Ron Capps, the 2016 world champ from Don Schumacher Racing, remained in the No. 2 spot in his Dodge Charger R/T at 3.873 and 327.19. Capps will face two-time world champ Cruz Pedregon and his Toyota Camry to start eliminations. Meanwhile, point-leader J.R. Todd of Kalitta Motorsports qualified seventh at 3.928 and 323.66 in his Camry, setting up a first-round match against teammate Shawn Langdon. In Pro Stock, Coughlin posted his 26th career pole and third in 2018 after his quarter-mile run of 6.496-seconds at 211.76 mph in his Elite Motorsports Chevrolet Camaro SS during the third round of qualifying. Coughlin, who has three wins this season, will look for his first win at Gateway since 2002 starting with an opening-round match with Mark Hogan and his Pontiac GXP. Erica Enders, a two-time “Factory Hot Rod” world champion, qualified second in the Elite Motorsports Camaro with her run of 6.508 at 212.53 on Saturday. The two-time Gateway winner will meet Charlie Wescott in the opening round of eliminations. Point-leader Tanner Gray is in the No. 7 position after his pass of 6.521 at 212.03. Ellis raced to the top of the Pro Stock Motorcycle class with his quarter-mile pass of 6.764-seconds at 196.76 mph aboard his Screamin’ Eagle Vance & Hines Harley-Davidson Street Rod during the fourth session. Ellis, who earned his first No. 1 qualifier of the season, will face Mark Paquette and his Buell in the first round. Teammate Andrew Hines, a five-time world champ, is second aboard his Street Rod after his pass of 6.782 at 197.74 and will race Ryan Oehler and his Buell in the opening round. LE Tonglet, the 2010 world champ, is third with his run of 6.812 at 195.76 aboard his Suzuki. Eliminations are scheduled to begin at 11 a.m. Sunday. FOX Sports 1 will air one hour of qualifying on “Sunday Nitro” beginning at 8 a.m. (EDT). FS2 will re-air two hours of Friday’s time trials at 10 a.m. followed by Sunday’s earlier one-hour program. FS1 will continue with three hours of live finals coverage at 2 p.m.
Top Fuel _ 1. Steve Torrence, 3.675-seconds, 327.19 mph vs. 16. Bill Litton, 3.925, 310.20; 2. Clay Millican, 3.692, 329.83 vs. 15. Shawn Reed, 3.812, 326.24; 3. Billy Torrence, 3.717, 328.06 vs. 14. Pat Dakin, 3.796, 322.58; 4. Blake Alexander, 3.717, 326.87 vs. 13. Terry McMillen, 3.796, 326.32; 5. Leah Pritchett, 3.718, 330.96 vs. 12. Scott Palmer, 3.779, 323.74; 6. Tony Schumacher, 3.731, 330.72 vs. 11. Richie Crampton, 3.774, 320.05; 7. Antron Brown, 3.750, 320.58 vs. 10. Doug Kalitta, 3.769, 323.04; 8. Brittany Force, 3.755, 328.78 vs. 9. Mike Salinas, 3.760, 328.78. Did Not Qualify _ 17. Luigi Novelli, 3.930, 278.69; 18. Lex Joon, 4.244, 202.45; 19. Chris Karamesines, 5.717, 158.26. Funny Car _ 1. Robert Hight, Chevy Camaro, 3.844, 326.16 vs. 16. Dale Creasy Jr., Dodge Stratus, 4.060, 309.06; 2. Ron Capps, Dodge Charger, 3.873, 327.19 vs. 15. Cruz Pedregon, Toyota Camry, 4.013, 301.47; 3. Courtney Force, Camaro, 3.881, 331.04 vs. 14. Jim Campbell, Charger, 4.012, 297.68; 4. Tommy Johnson Jr., Charger, 3.896, 327.11 vs. 13. Del Worsham, Camry, 4.001, 321.73; 5. Bob Tasca III, Ford Mustang, 3.915, 320.58 vs. 12. Jonnie Lindberg, Mustang, 3.996, 315.71; 6. Tim Wilkerson, Mustang, 3.924, 325.53 vs. 11. Matt Hagan, Charger, 3.967, 320.13; 7. J.R. Todd, Camry, 3.928, 323.66 vs. 10. Shawn Langdon, Camry, 3.943, 322.81; 8. Jack Beckman, Charger, 3.929, 326.00 vs. 9. John Force, Camaro, 3.934, 327.11. Did Not Qualify _ 17. Terry Haddock, 4.093, 287.90; 18. Jack Wyatt, 4.189, 296.18. Pro Stock _ 1. Jeg Coughlin Jr., Chevy Camaro, 6.496, 211.76 vs. 16. Mark Hogan, Pontiac GXP, 6.769, 204.60; 2. Erica Enders, Camaro, 6.508, 212.53 vs. 15. Charlie Westcott Jr., Ford Mustang, 6.733, 205.35; 3. Jason Line, Camaro, 6.513, 212.79 vs. 14. Val Smeland, Camaro, 6.624, 208.14; 4. Bo Butner, Camaro, 6.515, 212.39 vs. 13. Alan Prusiensky, Dodge Dart, 6.587, 208.78; 5. Drew Skillman, Camaro, 6.515, 211.89 vs. 12. Kenny Delco, Camaro, 6.568, 210.90; 6. Vincent Nobile, Camaro, 6.516, 211.79 vs. 11. Fernando Cuadra, Camaro, 6.547, 211.53; 7. Tanner Gray, Camaro, 6.521, 212.03 vs. 10. Chris McGaha, Camaro, 6.532, 211.99; 8. Greg Anderson, Camaro, 6.527, 212.06 vs. 9. Deric Kramer, Camaro, 6.529, 211.86. Did Not Qualify: 17. Robert River, 6.794, 203.06. Pro Stock Motorcycle _ 1. Chip Ellis, Harley-Davidson, 6.764, 196.76 vs. 16. Mark Paquette, Buell, 6.933, 191.02; 2. Andrew Hines, Harley-Davidson, 6.782, 197.74 vs. 15. Ryan Oehler, Buell, 6.930, 194.10; 3. LE Tonglet, Suzuki, 6.812, 195.76 vs. 14. Jim Underdahl, Suzuki, 6.925, 193.35; 4. Eddie Krawiec, Harley-Davidson, 6.820, 195.56 vs. 13. Joey Gladstone, Buell, 6.896, 193.82; 5. Matt Smith, EBR, 6.824, 199.61 vs. 12. Scotty Pollacheck, Suzuki, 6.893, 194.35; 6. Steve Johnson, Suzuki, 6.832, 196.10 vs. 11. Angie Smith, Buell, 6.877, 193.85; 7. Hector Arana, EBR, 6.866, 197.45 vs. 10. Jerry Savoie, Suzuki, 6.872, 195.76; 8. Hector Arana Jr., EBR, 6.869, 198.99 vs. 9. Angelle Sampey, Buell, 6.871, 195.11. Did Not Qualify _ 17. Kelly Clontz, 6.943, 192.49; 18. Karen Stoffer, 6.982, 191.02. Mike Castellana set the national elapsed time record Saturday afternoon to clinch the No. 1 qualifying position at the E3 Spark Plugs NHRA Pro Mod Drag Racing Series presented by J&A Service portion of the AAA Insurance NHRA Midwest Nationals. This weekend’s Pro Mod racing, presented by Real Pro Mod Association, is the ninth of 12 races this season. Castellana powered his Chevrolet Camaro down the quarter-mile in 5.676-seconds at 255.39 mph to set the E.T. record. Castellana earned his second pole of the season and 12th of his career in pursuit his first victory of 2018. He will face Shane Molinari in the first round of eliminations. Mike Janis moved into the second position with his run of 5.725 at 248.02 and will race Brandon Snider Sunday when eliminations begin at 12:20 p.m. Steve Jackson is third following his pass of 5.727 at 252.05. Pro Modified _ 1. Mike Castellana, Chevy Camaro, 5.676, 255.39 vs. 16. Shane Molinari, Pontiac Firebird, 5.777, 255.58; 2. Mike Janis, Camaro, 5.725, 248.02 vs. 15. Brandon Snider, Chevy Corvette, 5.774, 247.34; 3. Steve Jackson, Camaro, 5.727, 252.05 vs. 14. Rickie Smith, Camaro, 5.764, 251.91; 4. Rick Hord, Corvette, 5.728, 255.48 vs. 13. Danny Rowe, Camaro, 5.764, 252.66; 5. Khalid alBalooshi, Camaro, 5.729, 251.06 vs. 12. Chad Green, Corvette, 5.756, 248.80; 6. Jim Whiteley, Camaro, 5.729, 250.55 vs. 11. Jason Scruggs, Camaro, 5.756, 248.98; 7. Marc Caruso, Camaro, 5.743, 244.43 vs. 10. Michael Biehle, Ford Mustang, 5.754, 255.97; 8. Jeremy Ray, Corvette, 5.745, 249.67 vs. 9. Erica Enders, Camaro, 5.752, 254.38. Did Not Qualify _ 17. Steven Whiteley, 5.779, 252.19; 18. Todd Tutterow, 5.798, 247.75; 19. Pete Farber, 5.803, 248.29; 20. Dan Stevenson, 5.808, 255.63; 21. Steve Matusek, 5.824, 249.81; 22. Doug Winters, 5.861, 242.54; 23. Chip King, 5.885, 246.71; 24. Michael Bowman, 5.894, 255.24; 25. Clint Satterfield, 6.336, 244.52; 26. Keith Haney, 7.527, 126.01; 27. Harry Hruska, 7.573, 200.89; 28. Bob Rahaim, 8.134, 138.19.